Discussion in 'Mixed Languages' started by silnwarez, Jun 7, 2018. As a begginer I am trying to make my first project on Autoplay Media Studio. Hope it was clear enought, to help me. What have you got so far ? Do you know the command prompt to show the activation status ? I have dabbled in AMS. I have a AMS project which shows some DISM commands. I may well be able to have a go at this for you. Could be fun to try. Been having a go but sorry not got too far at all. using this command "slmgr -dli"
It gets a Pop Up window with the info. In my AMS project i have one button and two inputs. I get the info in "input1"
I think the problem is "slmgr -dli" gives the pop up and not the info in the command window. I am guessing this is what you want. gives the info inside the CMD window. Whats written in the .vbs file ? The cscript command just forces slmgr(.vbs) to show output directly in CMD window without the nasty pop-up. When using it it needs to specify the slmgr.vbs with extension, else it will error. I am doing summet wrong ? Just get error, but the error is in input1. Input Error: Can not find script file "D:\Indigorose Projects\AutoPlay Media Studio\AMS Projects 2017\1a - Triominos Scoreboard\Licence Activation Status\CD_Root\slmgr.vbs". in an open command prompt window and the info is there, not in a pop up.. I just answered above your post . Needs more looking into.. Later..
A little further with this now. I copied the "slmgr.vbs" file and put in the root of my AMS project. Placing the slmgr.vbs file in the root of the project. Just tested it, works really well. I am still trying to learn ... more and more, using AutoplayMS as a begginer as I am. I have been messing a little with this.. Lets see if I can explain what i have done..
Make a new AMS project. 2 x input ----- "input1" "input2"
make them both not visible. Add to the project a text document called "SLMGR"
Add to the root of the project "slmgr.vbs"
it runs slmgr.vbs but because the input1 is set to not visible this runs in the background. Then it writes the result to the slmgr.txt file. 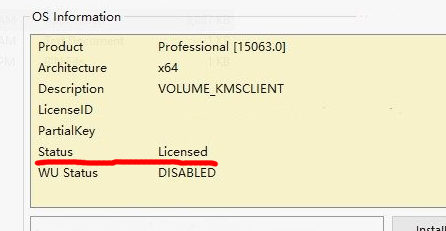 then it checks the text file for the word "Licensed" and if it finds it a message pops up confirming the license status. If it does not then another message pops up confirming the unlicensed state. if you change Licensed to a different word and test you will see the result.. I have not been able to check this on an un-licensed machine. Hope this helps you in developing your project. Very clear and nope, done with the questions.